Blooming Where Planted: Epic Vacation, Day 8 - AK and Happy Anniversary! June 6. 17 years ago on June 6, I married my Best Friend. So it was perfectly wonderful to spend the day in our favorite place, Walt Disney World. On this day, we chose to spend the morning/afternoon in Animal Kingdom. Animal Kingdom has a lot more animals and flowers than the other parks. It was a lot of fun to photograph. This tree is called the Tibouchina, or Glory Flower. It was blooming all over AK, and gorgeous! 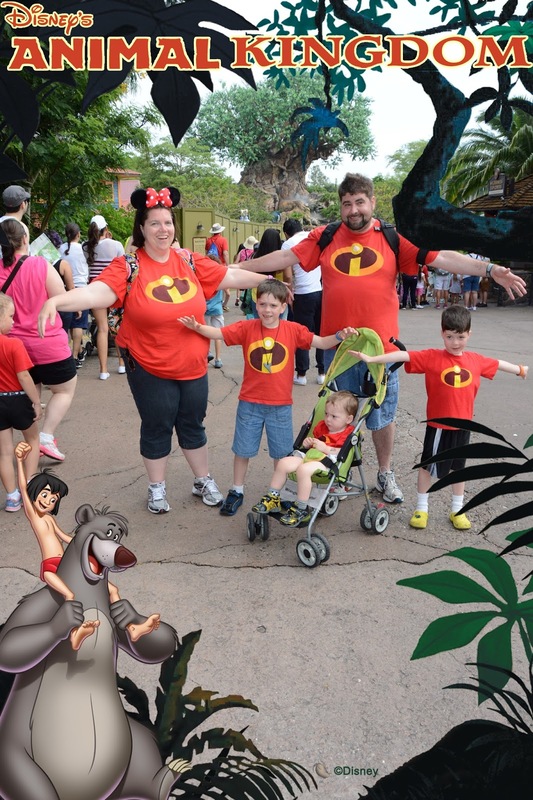 All my monkeys and I take over Animal Kingdom! A new fun thing to do in Animal Kingdom that didn't exist the last time we went was the Wilderness Explorers. These Scout-like folks are posted all over the park, and they give you a book, and you can earn patches (or stickers) by learning different things about the animals and life in Animal Kingdom. Both boys got books, and it ended up being a great distraction while we were in lines, or while we figured out what we were going to do next. We didn't get many patches, but that was ok to me. This was their motto. Like Russell from Up! "The Wilderness Must be Explored. Caw Caw. Rawr!" Doesn't look like it's grown much, although Everything around it sure has. I love how shady this Park is, lots of greenage. It's like a Zoo meets an Amusement Park, perfect! The story behind it is that the last time we were in Disney World, Chris wanted to ride this ride. But when he got up to the front, they told him No. He was too short. The ride starts at 48 inches. He had a Freakout. They gave him a Pass, so that when he came back, he could walk right on, they said. And he has clung to that pass for the last three years. Last month, he went to the doctor, and finally measured in at 48 1/2 inches tall! Just in Time! So as soon as we got to Animal Kingdom, while Daddy and the littles went ahead to Nemo to stake out seats for us, Chris and I rode Primeval Whirl. It was like a combo of Teacups and a Roller Coaster, the cars would spin on curves, Eric would not have done well. It was a little rickety like an old time amusement park ride, and Chris was a little scared initially, but when the ride was over, Chris thought it was Fabulous! Time for Finding Nemo - The Musical! If you have never seen this show, you should! The music is catchy, the whole thing is hypnotizing, even to the littlest viewer. The music from this show is Great, so I decided to stop at the shop and see if I could find a Nemo the Musical CD. I didn't initially, though I did find a great coffee mug with the seagulls that said Mine! I wasn't going to get it, but then I saw it at Epcot, and I did later. There was a little stand outside, where I actually found the CD! I was pretty thrilled. Then it was time to Dash across the park. In theory, we had Fastpasses to see Lion King, gone to Nemo, and crossed back across to the Safari. Instead, we decided to take pics and mosey into the park, we actually didn't make Opening, and went to Nemo first. THEN to the Safari! We got to see a lot of the same animals we have at our zoo, like elephants, giraffes, and zebras. But there were a few we don't have like hippos and both Black AND White Rhinos. Because they are very much a zoo especially on the safari ride, they are very careful not to spook the animals. Consequently, they have no fear of humans, or of the truck we drive. We had a zebra cruise RIGHT next to our truck. Just when I thought that was the coolest sighting of the day, this happened. This Mrs. Ostrich stopped in the middle of the road. Blinking her weirdo ostrich eye. We sat there so long, the truck behind us got stopped. This animal was not moving. And our driver was not going to do anything to scare it. He couldn't flash the lights, he couldn't honk the horn, or yell. He could turn on the windshield wipers. That's it. But he wasn't allowed to scare it, because that goes against what they are trying to do. If the animals get scared, they'll hide, and if they are hiding, then the visitors don't see them. Huh. I hadn't really thought of it. So we just sat and let this ornery ostrich hog the road. Finally, of her own volition, she finally started moving down the street, back to us, I'm pretty sure she Strutted down the middle of the street, so we had to crawl behind her for about 1/4 mile. Then she pulled over, apparently she was guarding her nest, so the boys were on that side of the truck, so they got to see it. An egg, actually in a nest as we drove by. Cool. And here I'm going to get a little preachy. As we were getting off the ride, stopped at one of the Wilderness Explorer booths, I saw a couple guys wearing the exact same t-shirts as we were! It was obviously a gay couple. I gave them my Thumbs Up for their equally awesome taste in t-shirts! I remember someone 'warning' me that we were coming to Disney during the Gay Days. Someone said there was bound to be over the top PDA. I don't like over the top PDA from anyone, straight or gay. I was prepared to pull my kids aside, and distract them if necessary. But there wasn't any over the top PDA. There were Awesome T-shirts. I giggled for 20 minutes when a group of guys went by in pastel shirts that said, "I slapped Ouiser Boudreaux!" I'm still laughing about that one. However, there was no PDA, nothing offensive. Actually, since phobics were most likely staying away, we probably had an even more magical time. And this was a pinch of the magic. After a brief interaction, we pulled over to get Jake back in his stroller. I didn't realize the guys had pulled over too, to dig in their backpack. They returned to us, and handed us a pair of black masks. Incredible Masks! Brilliant! I hadn't thought of that. But it was brilliant. And frankly, how kind was that?! The boys even shared the masks with Jacob while we waited in line for Lion King. We went to DAS Lion King after the Safari. It was just about starting time for the second to last show of the day. I didn't know if it was possible for us to get in on it. But the CM was Extra Awesome and didn't make us wait at all. She just shuffled us into the handicapped line. Now, we did have to wait for 15 minutes there, and Chris was losing it a little, luckily there was some space around us, and we had the masks to play with, but we ended up getting preferred seating, right next to the handicapped seats. Wonderful seats! And the kids, oh my, they were entranced. Chris has loved this show ever since the first time we took him to it. Eric and I saw it on our honeymoon too. So it's always had a special spot in my heart. However, they made this one extra magical. There was a point in the show, where they grabbed a couple kids in the audience, and they came up and grabbed Christopher. He went eagerly and danced around in a brief parade around the room. It was hard to catch him on camera, it happened so fast. But when the parade was over, and the other kids were going back to their seats, he was taken over to Timon, the only kid that was. And Timon said Hi, and gave him a hug, and I burst into tears. I could truly Feel The Love Tonight. It seemed to us that was a Perfect note for us to end our visit to Animal Kingdom on, and it looked like it was going to rain. So we headed back to the hotel. We got there in time for a brief rest before our sitter came. We used Kids's Nite Out. We had used this company in 2009, and we were very happy. We'd heard other happy references too. In 2009, they brought new DVDs to watch. I grabbed some cheeseburgers from Gasparilla's for dinner. And Eric and I got cute, and headed out for our special Anniversary Date Dinner! Yes, we totally took a selfie in the Grand Floridian lobby. This place is so beautiful, I could just sit here all afternoon. How lucky we are to stay here, and be able to pop in and out, with the music playing, and the joy abounding! For our date, we hopped on the monorail, and tootled over to the California Grille on top of the Contemporary hotel. We got happy little drinkies, and toasted our many happy years, and to many more. As we sat, and ate plate after plate of sushi, the sun went down. And it was Gorgeous. The last few times we've come here, it has been dark upon arrival. I'd forgotten how beautiful the sunset was from up here. Now, of course we took pictures of our food. We ended up deciding not to use two table service credits for our meal. Since we wanted to try mostly sushi and not do a regular main course, we opted to pay out of pocket. It was a good choice. We started with Onion soup, best onion soup ever, with a small dollop of fresh crab meat on it. Then we got a soft shell crab, and our 'main course' a dragon roll, and my favorite the spicy kazan. That's the one that Eric cried when he ate however many years ago. There was no crying this time, but there was so much awesomeness, words and pictures don't begin to cover it. We watched the sun set between courses. Then it was time for dessert. We watched fireworks for Epcot, and Hollywood Studios. And we came in and ordered dessert. I got a blueberry napoleon, layers of blueberry cream, custard, and light cake. Eric got a cheese plate. Cheese and things to pair with it, sweets and crunchies. We were both very happy. I'd mentioned to our waitress that I had a hard time deciding between the blueberry and the creme brulee. She brought me Both. On top of the Creme Brulee was a thin sheet of chocolate that said Congratulations from the California Grille. I don't know how they do it, but it was fabulous. What a beautiful surprise. As you can imagine it took us a while to eat three desserts. I couldn't eat two. I dabbled at both. And before we knew it, it was time for the Magic Kingdom fireworks. We hadn't thought we'd be present for them. We thought we'd be long done with dinner, since our reservations were for 7:30, and that we'd go shop downstairs and have to come back up, or that we'd go into MK itself. But our meal took so long, that we were there for the fireworks anyway. When we'd originally made our 7:30 reservation, fireworks were at 9, not a problem. But then as summer kicked in, fireworks got bumped to 10. I didn't think we'd see the fireworks, so I didn't even bring my good camera, I only had the point and shoot. But it all ended up working out, because our waitress was nice, and everyone was slow. But an enjoyable level of slow. No pressure, not hungry, feed me stat slow, just pleasantly enjoyably slow. And by the time we left the hotel it was 10:30, and we were practically ready to turn into pumpkins, long before midnight, so we just went back to the hotel and crashed with our already sleeping little ones. It was indeed a Happy Happy Anniversary.